I find that every once in a while, my own personal sense of taste will fly directly in the face of the words I read on a beer label. “Finishes dry,” the back of a bottle will proclaim, on something cloyingly sweet. “A hint of maple,” says the abomination of artificial flavors. “Hugely hoppy” says the humdrum IPA lacking any true hop-derived punch. When it comes to marketing copy, you just never know. 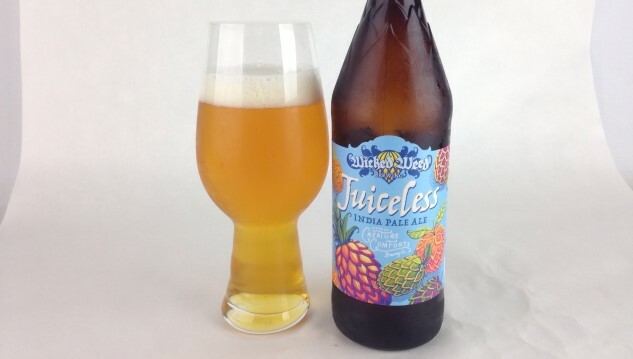 Enter Juiceless, the new headline-making IPA collaboration between Asheville’s Wicked Weed and Athens’ Creature Comforts, two breweries known for making bang-up east coast IPAs. According to that marketing copy, the beer represents the “cracking of the juicy code, without using fruit.” Which is to say, it’s meant to be an ultra-juicy nouveau American IPA, similar to the glut of fruited IPAs on the market, except the flavors are derived entirely from hops alone. It’s the verdict that is a little confusing: I don’t feel like it achieves quite what it intended to achieve, but at the same time I quite like the result. Wicked Weed and Creature Comforts have made an excellent IPA, but it may not be quite the way it was advertised. I should point out first that the beer they describe trying to create isn’t quite so unusual or novel as the label makes it sound. “Fruited IPA flavors” tend to be what every other non-fruited IPA is trying to achieve in 2016, and for good reason—the category has exploded in the last year, something I’ve written about in detail for Paste. But despite that proliferation of IPAs actually made with fruit, the non-fruited juice bombs derived purely from hops tend to be the ones that become hyped, sought-after beer in the current beer geek community. Just look at the emergence of northeast IPAs (NE-IPA) as a driving style that dominates the tip-top of online ranking sites. Most of them are huge, chewy juice bombs with massive fruit flavors, all derived from hops. That is honestly the type of beer I expected Juiceless to be emulating, but in execution this IPA is actually a bit different. There’s only one way to say it: It’s just not as “juicy” as one would expect for a beer built around that concept in its name. Rather, it’s a drier, crisper, still very fruity IPA that captures a different dimension of its fruit flavors—less juice and more zest. It’s something more pure, clean and quaffable than those NE-IPAs; less decadent and more familiar, but quite delicious. On the nose, citrus zest/essential oil aromatics waft from the glass that are big on lemon and pineapple, notes that are very clean and distinct. Its aroma suggests a refreshing IPA, and that’s what this one is. On the palate, bitterness is low-to-moderate, with huge, zesty citrus flavors that I once again contend are technically different from “juicy.” In my mind, the deciding factor is how quite dry and quaffable this IPA is. “Juicy,” as a perception, is something that I think is driven by a certain level of residual sweetness that pairs well with citrus and tropical fruit hop notes, giving those flavors the perception of sweet, natural fruit juice. This IPA, on the other hand, stays dry and extremely drinkable, which gives it more of a West Coast parentage to me than an East Coast or NE-IPA one. As it warms, some very nice, complex, funky tropical fruitiness emerges, chased by resin and grassy notes. Malt, unsurprisingly, is an almost complete afterthought, but that’s to be expected in this sort of IPA. All in all, this IPA strikes me as more classical than it is experimental, but its purity of flavors should make it a must-drink for folks who like their IPAs bright, vivacious and fruity while still remaining dry. Stylistically, you wouldn’t compare it to something from Tree House, Trillium or our recent 247 IPA blind-tasting winner Prison City, but that’s not a criticism. If anything, what it reminds me of most is another great beer that made the finals of that same tasting: Alpine Beer Co.’s rock-solid and refreshing Duet IPA. Regardless, putting this beer out on tail end of summer heat was a wise choice, as Juiceless is one of the most crushable IPAs I’ve tasted in quite a while. Give us this beer in cans and watch it fly off the shelves for the next few months. Breweries: Wicked Weed and Creature Comforts Brewing Co.
Jim Vorel is Paste’s resident beer guru. You can follow him on Twitter for much more craft beer content.